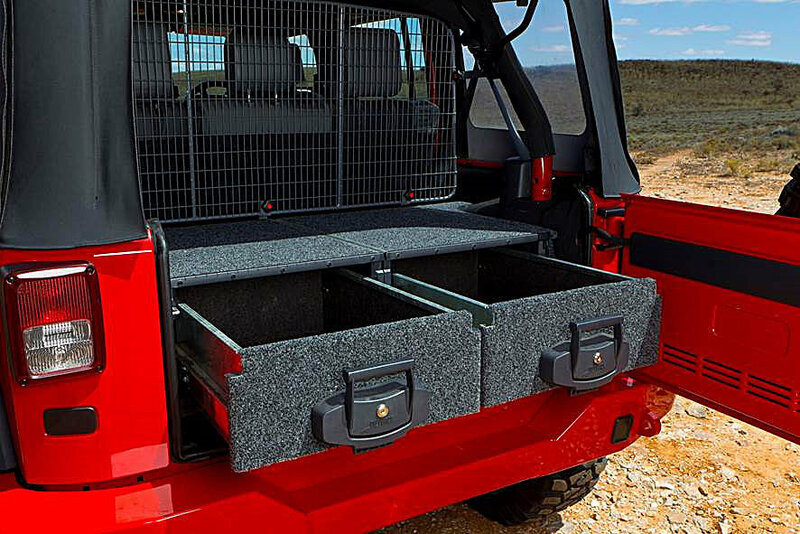 The ARB Outback Solutions Drawer Kit incorporates 2 drawers allowing for plenty of accessible and secure storage and is engineered for on and off road touring with lockable push-pull slam-shut latches. It is a great way to keep your gear secure and easy to access. The stainless steel runners allow for smooth drawer operation and the reinforced floor ensures maximum support for all cargo. Features a self locking anti roll-back system to lock the drawers into place. Outback Solutions Modular Roller Drawers have unique and practical features incorporated into their design to ensure high quality, maximum functionality and ease of use. Locking mechanisms on the roller drawer and roller floor eliminate movement while closed. Retaining the drawer and roller floor in this way prevents rattles and wear and tear while driving. The roller drawer and roller floor bearings run on purpose-folded stainless steel runners. Smooth operation is ensured because stainless steel offers the best surface for bearings to run on resulting in smooth quiet operation. Galvanized bearing runners are not used because the galvanized coating transfers onto the bearings creating rough operation and an opportunity for corrosion to start. Tool chest style telescopic runners are not used because of the slop and movement they allow. This constant movement while driving accelerates wear and deterioration when used in automotive applications. Exterior surfaces are finished in hardwearing commercial carpet and interior surfaces are trimmed in an automotive trunk material. Both materials resist abrasion and conceal dirt from gritty off-road conditions. Aluminum and ruggedized plastics are used to mirror the tough nature of the Wrangler. Slam shut/pull open handles make opening and closing both the roller drawer and the roller floor an ease, even with hands full of gear. The roller drawer handle is key lockable and the roller floor has a mechanical lock under the top behind the handle. The roller floor can be locked before closing and key locking the drawer to provide good security. Sub woofer relocation bracket (JKBRKT1) required when 2007-09 vehicles are equipped with factory sub woofers.